Interior designer at City of Edinburgh Council, Lesley McMillan, has worked with Altro for a number of years, and has recently completed a number of school projects using Altro’s Wood Safety range to help ‘bring the outside in’. Her belief in the benefits of biophilic design is at the heart of her work with schools. “Biophilic design brings the beauty and colour of nature into the built environment,” says Lesley. “Research has shown that we need to connect with nature and that exposure to it lowers stress, elevates mood, creates a relaxed feeling and improves cognitive function. “This also applies very strongly to learning environments, such as schools, where we have seen that by introducing visual and tactile references to nature — such as patterns, colours, flooring and motifs — we can positively impact on children’s physiological and psychological behaviour, overall mood and capacity to learn. We know they are happier and more productive in this type of environment. Altro Wood Safety is an attractive, general purpose 2mm wood-look flooring, available in a range of designs with different plank sizes and shades including a bamboo-look fine-line design and wide plank classic and rustic designs. It is designed to cope with medium to heavy traffic and has sustained slip resistance for the lifetime of the floor. Altro Wood Safety has matching colour and design options with Altro Wood Safety Comfort, a 2.85mm thick safety flooring that offers aesthetics combined with comfort and 14dB sound reduction. Lesley has used flooring from these ranges for two recent school projects. “Altro Wood Safety is a product range that ticks so many boxes for us, and there are many criteria it has to meet. Firstly, it’s a great safety flooring; reliable and hard-wearing. But it also strongly meets our need for a beautiful, natural-looking, surface. “It has a nice texture and delivers slip resistance to give flexibility in areas which have wet play, but not too rough where comfort is required. I generally follow the principle of using 100% vinyl flooring and rugs where needed. In many situations this is more practical, flexible and cost effective than fixed sections of carpet. “St Margaret’s School, in South Queensbury, Edinburgh, was a fascinating project where we used Altro Wood Safety throughout. It was the refurbishment of a wing at the school, for children aged four to nine. “As part of Scotland’s ‘Schools for the Future’ scheme, we wanted to totally engage the children in the interior design at St Margaret’s, to create a childlike design with them and build a space that was the product of their imagination. Teachers and children were all involved and they visited schools, offices and many other spaces to develop ideas. “The final design reflected the arrival of Queen Margaret in Scotland, a journey over the ocean. Altro Wood Safety in the shade Mountain Oak was used to represent the wooden deck of the ship. There is also a library learning cave — based on the cave Queen Margaret used to pray in — where we used a rich dark shade called Vintage Cherry. There were also many other historic inspirations from the local area. Head teacher at St Margaret’s, Katy Westacott, said: “We are really pleased with the Altro flooring in the school. Aesthetically it’s a lovely looking surface; very natural and rustic, and Lesley chose the perfect shades to create a warm, homely feel. “The floor brings the character of the space to life and brings nature indoors. Using the flooring to represent the deck of the ship and the cave was a stroke of genius by Lesley, it adds such an authentic feel. “We were considering laminate flooring initially, but this vinyl surface is so much better acoustically, and from a safety point of view it gives us peace of mind that the children won’t slip and slide, even if the floor gets wet. “The surface also gives us great flexibility to use the space for a number of activities; we can move furniture, use rugs, and can consider a wet play area too — very adaptable. Cost was also key for us, and this is such a robust and durable flooring, so we know it won’t wear out or need replacing for many years to come. Altro Wood safety Comfort was the flooring of choice at the recent refurbishment project at Murrayburn Primary School, as Lesley explains. 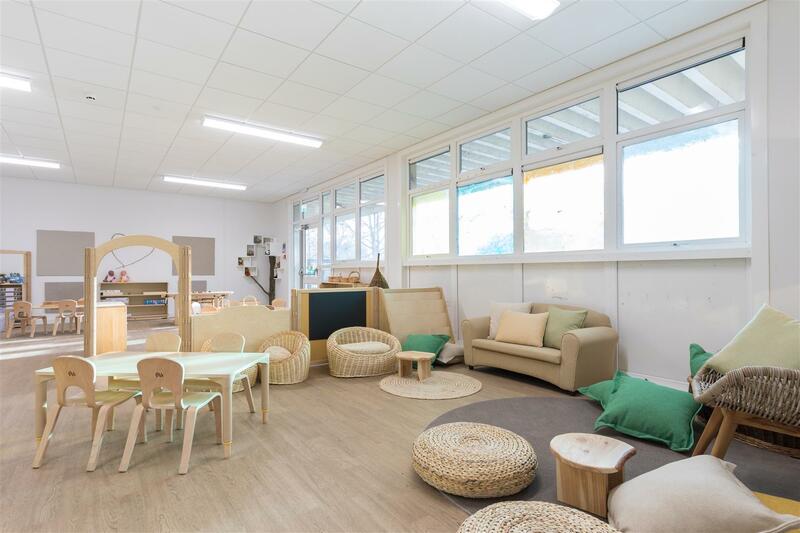 “Here we used Altro’s Wood Safety Comfort flooring throughout to not only deliver the same biophilic principles as St Margaret’s, but to also maximise comfort underfoot and address the acoustic needs of the space and reduce noise. “This project was the refurbishment of a multi-use room at the school that adjoined a community kitchen. So its needs were many – it had to be flexible and cater for all ages as a classroom, community space and somewhere for families too. “The comfort and noise-reducing properties of Altro Wood Safety Comfort were key for this space. Many of the children attending the school have special learning needs, such as autism, so it was paramount that the space was quiet and comfortable with minimal noise. The flooring is also ideal for shoeless learning because it’s so comfortable to walk on. “In addition, the flooring offers low residual indentation, which for a flexible space like this is essential, as it means furniture can be moved and rearranged without marking the floor. Leanne Hepburn, Head Teacher at Murrayburn Primary School, is delighted with her new space. “It is being used on a daily basis by both adults and children and the overall feeling is that the flooring helps creates a very grand and special atmosphere. “When the room was empty and the new flooring was down it immediately had a wonderfully imposing feel. Having a good, high quality flooring really lifted the entire room and set the scene for a very special space. It really looks lovely and the colour is perfect. “People behave differently in here because of the feel; they talk more softly, walk more slowly and generally behave better. The school is 80 years old, but this hub gives the school a new lease of life. From an acoustic and comfort point of view the flooring works very well. The children use it as a library space, so it’s very much a quiet place to read and reflect. They are more than happy to take their shoes off and walk on the floor, because it’s so comfortable. They would never do that in the gym!